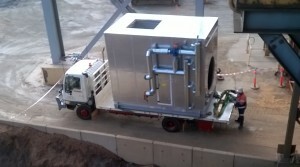 Airskill have been manufacturing custom air handling solutions since 1999. Our strength and growth has come from flexibility of the products we provide the market place. Custom performance coupled with the ability to build our units with a wide selection of materials and components, has seen us strive to continually provide a better product. We constantly focus on providing improvements with delivery, pricing, design flexibility and product support. Drawing on the talent and experience of the staff at Airskill, combined with the expertise from our supply chain we are able to work with consultants, contractors and end users to provide the right solution for your project. We pride ourselves on our ability to share our processes with partners to bring about the right outcomes. We manufacture all of our units from our plant in Cockburn Central. We are proud supporters of local industry and we prioritise supporting local suppliers. It has become obvious to Airskill that products that are made in Australia are formed with our conditions and expectations in mind, which is why our local capabilities is one of our greatest advantages. Airskill is a multiline supplier, which brings with it a broad exposure to many aspects of systems and their challenges. Our support begins at the design stage and follows all the way through to the operation of the unit you purchase from us. As much as we welcome our supporters into our office and factory to be a part of our process, we also want to be a part of the application of the SkilledAir Australia product.